Drydocks World – Southeast Asia Pte. Limited (DDW-SEA), the Southeast Asian subsidiary of Drydocks World, announced the deliveries of vessels Endeavor, Greatship Ahalya, Mermaid Vision and Ark Dartmoor from their Drydocks World – Nanindah yard and Armada Tuah 104 from their Drydocks World – Pertama yard. 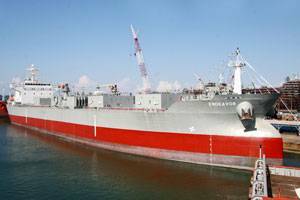 The Endeavor, a fully pneumatic self discharge cement carrier designed by Shiptech Pte. Ltd. was delivered to Endeavor S.N.C., a subsidiary of Setaf Saget of France, a company of the Bourbon Group. At 30,000 dwt and length of 557.7 ft, she is the world’s largest vessel of her type and one of the largest vessels to be built at DDW-SEA’s designated volume, shipbuilding facility - the Nanindah shipyard. The 80 tons bollard pull Greatship Ahalya, 105 tons bollard pull Mermaid Vision, 90 tons bollard pull Ark Dartmoor and 150 tons bollard pull Armada Tuah 104 are all Anchor Handling Tug/Supply (AHTS) vessels, built to adhere to the requirements of the American Bureau of Shipping (ABS). The Greatship Ahalya, which is owned by India’s Greatship (India) Limited, is the third in a series of four vessels ordered at the Drydocks World – Nanindah yard. The Greatship Akhila and the Greatship Asmi were delivered earlier this year. The Mermaid Vision (owned by Mermaid Marine Australia Ltd) and the Ark Dartmoor (delivered to Singapore Retail Pte. Ltd.) are both 1,650 dwt AHTS vessels with similar designs, each with 222.4 ft in length and equipped with external fire-fighting capabilities, Class 1. Armada Tuah 104 is owned by Malaysia’s Bumi Armada Berhad, Kuala Lumpur, that has contracted a total of nine new building projects with DDW-SEA. To date, four maintenance & support vessels and Armada Tuah 104 have been delivered, while the remaining four AHTS vessels are currently in progress.